4500 of the SUVs recalled in South Africa. 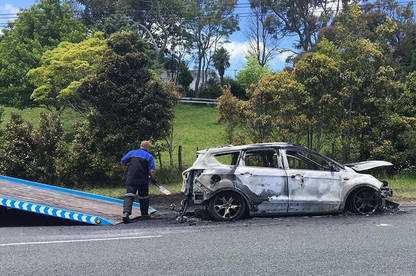 Ford is investigating whether a Kuga SUV that caught fire in Auckland is linked to engine fires in South Africa that have led to 4500 of the vehicles being recalled. Eden O’Connor was driving in Auckland on December 16 when she noticed an emergency notification on the dash of her Kuga that said to pull over. Eden told the three children to stay in the car while she got out, but as she closed her door and looked towards the bonnet she saw flames. She told her grandmother to get the 11- and 6-year-old out of the car, while she tried getting her 17-month-old nephew out of his car seat. Some truck drivers tried to put the flames out with their fire extinguishers but were unsuccessful. 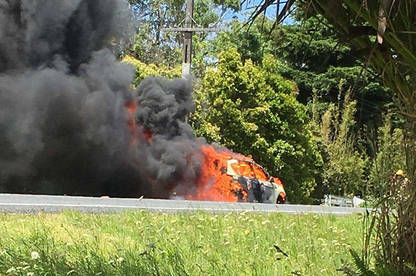 By the time the Fire Service arrived the car was engulfed in flames. Eden said she was impressed with how her local Ford service department had handled the incident, by making sure she had a replacement car to drive, but she hadn’t been contacted by Ford’s head office. In South Africa, 4500 1.6L Kugas built between 2012 and 2014 have been recalled because some engines have overheated and caught fire. Eden’s Kuga was a 2013 model but had a different engine size. Ford New Zealand communications manager Tom Clancy said Eden’s case was “a major concern” and under investigation. “It is also not just a local New Zealand investigation. Ford immediately red flags such things to Ford global headquarters for additional help and analysis,” Mr Clancy said.